On this date, the 4th of April in 1953 our paternal great grandfather Burris passed away in Drumwright, Oklahoma. He is buried in Drumright’s North Cemetery,* Drumright, Creek County, Oklahoma. 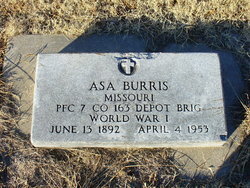 Asa and Rosa Burris had 11 children.